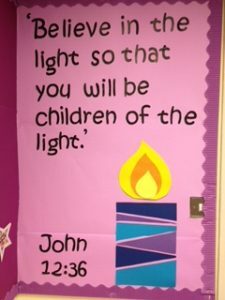 Early in November 2017, the Education team from the Archdiocese came into school to inspect our Religious Education provision. They spent the day observing lessons, looking at books and chatting to children and staff. We have now received their report. We are delighted to let you know that St John Fisher has been judge to be Outstanding in all 3 areas of the inspections: Catholic Life, Religious Education and Collective Worship. Some comments are shown below. If you would like a copy of the report, please ask at the school office and we will provide one for you. Pupils show a deep respect for themselves and others as made in the image and likeness of God. The behaviour of pupils is exemplary at all times. They show an ability to listen, to give thanks, to forgive and be forgiven and have a good understanding of right and wrong. They are quick to congratulate others. There is a strong sense of community at all levels, evident in the quality of relationships at all levels and the centrality of prayer to the whole community. The school is certainly a supportive and joyful community. Pupils approach their lessons with great interest, and enthusiasm. Pupils enjoy challenging activities, and respond well to opportunities which extend their learning. Behaviour in lessons is outstanding because all pupils enjoy Religious Education and they are rarely off task. The quality of teaching, learning and assessment in Religious Education is outstanding. Teachers consistently plan high quality lessons linked to pupils’ current assessment so that pupils learn well. As a result of this, teaching is mainly outstanding. Click below to see our last RE inspection report.